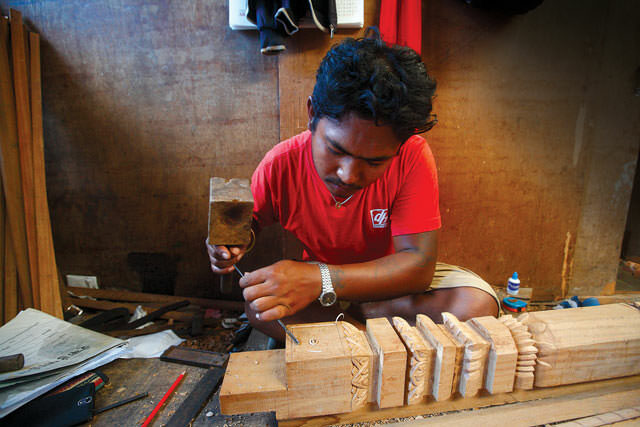 PASSED DOWN: Naresh Raj Shakya is reviving his ancestral profession of wood carving in Bungamati as he struggles to keep up with demand for monument reconstruction after the 2015 earthquake. After the earthquake, Nepal has to rebuild 700,000 houses and over 700 monuments. This can be seen as an enormous calamity, or as a big opportunity to jump start the handicraft industry and revive the arts. The demand for their unique skill sets to rebuild better homes with traditional features can promote local skills and materials, as is happening in parts of Patan and Bhaktapur. The first monument to be restored after the earthquake was Bouddha after it raised Rs230 million in cash and 30kg in gold from devout donors. Similar restoration of the hundreds of other monuments could generate a lot more funds to revive the traditional art of wood carving and metalwork. Nepal needs to keep its young people at home by providing them gainful employment, and a revival of the vernacular art and craft could do just that. Politics related to the diverse identity of Nepalis is also a great opportunity to re-design, re-create and recover the jewelry, musical instruments, textile, utensils and food heritage of each group -- skills and knowledge often preserved by families across Nepal. As each group celebrates its new year, perform rituals and give away gifts, the demand will grow and create a new economy at the local level. If tourists like these objects, it could translate into more revenue. As people become richer, they will want many of these objects in precious metal and as an investment or savings as has been the culture for a long time in Nepal. There is great demand in the West for Tibetan artifacts. As new trade routes and pilgrimage sites open up between Nepal and China, the demand for art and craft with Tibetan designs and themes is also going to rise. Tibetan carpets woven in Nepal are still popular souvenir items, and can be upgraded. In the Kailash Sacred Landscape and among the growing number of pilgrims there will be a demand for ritual objects to offer and bring back. The need for silver and brass water vessels (instead of plastic bottles) to take back holy water from Lake Mansarovar could revive the brass and silver industry. The demand for Buddhist art can grow if we think beyond Lumbini and the Kathmandu Valley and integrate Kushinagar, Sarnath, Bodhgaya, and later maybe even venture beyond to Taxilla, Nalanda and Xian. Design input is critical in this process, and the objects must be as functional as possible. These need to be of use in our daily lives, not dust collectors in show cases. They have to be easy to use and easy to repair and clean. With the Belt and Road Initiative we could even be exporting craft into the European market in bulk by train. The Silk Road was historically both the means and an end for trade. It kept this whole region prosperous for a long time and can help our art and craft to thrive again. There will be challenges. For example, artists and handmade craft and art cannot compete with mass produced ‘Made in China’ souvenirs. Assembly line Ganesh figurines have hit the Kathmandu market, and many Nepali artists are working in China to make the moulds for the mass production of Nepali artifacts. With 3D printing technology, antique handcrafted pieces can be replicated cheaply and with very little effort. There are a number of short term projects to help artists keep up with the changing landscape, but these efforts need to be sustained. Issues like line of credit, authenticity, certification and cash incentives for exporters, and general ease of doing business will take longer to establish. There is also the issue of incentives, and the middlemen and women who seem to make much more than the artists themselves. Everyone wants to sell and few want to produce. Finding the right balance for the way prices and profits are distributed along the value chain is critical if we are to encourage masterpieces in the market and not just cheap replicas. Copyright is often non-existent. It has become a joke that ‘copyright’ means copying without making any mistakes. How do we go about protecting the intellectual property of the designer and master artists? It seems that all the art pieces in our cities and towns in the form of an open museum are referred to as ‘priceless’ -- until they are stolen and auctioned globally. But Mustang is still further away from the world than most places in the world. In Dang, everyone is on edge. There is fear, bewilderment and silence. Valley villages have a hundred legends of kings and gods, histories of trade routes and invaders. India scientists may have found a way to bridge the digital divide.